Browse all apartments for sale in Allston below and contact Boston’s luxury Properties if you would like to learn more or schedule a tour. Register to save your favorite listings and receive notification when a new property matches your search criteria. This Corner 2 Bedroom unit has 1.5 Bathrooms, a wrap around balcony, desirable open living room/kitchen concept, and large closets. Kitchen is fully renovated with stainless steel appliances inc dishwasher/garbage disposal, marble countertops. This unit has wall/wall carpeting. Balcony has direct views of the Boston skyline with double sliders. The Building has a large roofdeck with an outdoor pool, a concierge/doorman, a gym, and washer/dryer facilities on every floor. 1 Garage parking spot included in the rent (Space #LL14). Available from 9/1/2019! Stunning rare to become available 2 bedroom duplex penthouse in wonderful Allston location close to T (10 min to Allston T stop, Bus 57, 64, 66, 503 in front of the complex), Mass Pike (Exit 19), Storrow drive and shops. There are tons of restaurants, stores nearby. Built in 2008 with 2 balconies and private roof deck with amazing views of the City. Light and airy spacious bedrooms, hardwood floors throughout, custom built in closets, central air, stainless steel appliances and washer and dryer in unit. 2 car garage. Two level penthouse with private roof deck! Modern and custom kitchen, large walk-in pantry, ceramic tile, granite countertops, disposal and all stainless appliances. Recently upgraded central AC system in bedrooms and new hot water heater. Master walk-in bathroom and walk-in closet is custom Elfa. Full size washer and dryer in-unit and security system. Deeded private deck facing Boston skyline great for entertaining. One covered garage spot, bicycle rack and private storage. Buildings features include swimming pool, gym, courtyard, common patio, building security and weekend concierge. Dog or Cat is permitted. Convenient location with easy access to major roads, 1 block to new Starbucks, restaurants, Coolidge Corner & B-line T stop. Available Now! Located in one of Boston's hottest neighborhoods. 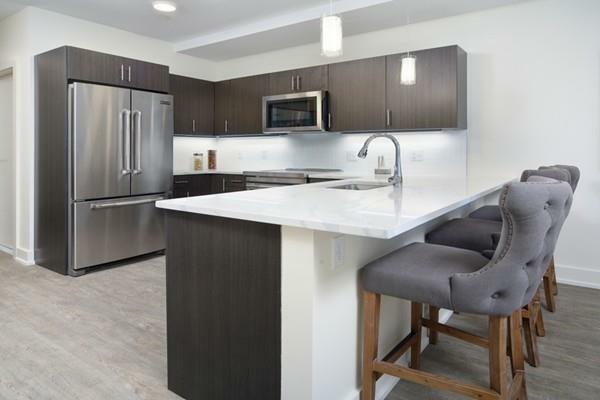 This spacious, sundrenched BRAND NEW 4th floor condo sits just 1 block from the new Boston Landing commuter rail station, as well as being 2 blocks into Allston Village. Unit features include an open floor plan, LED lighting, sleek cabinetry, quartz countertops, high end Jenn-Air appliances, central HVAC, in unit laundry, tankless hot water, ample closet space, hard wood flooring throughout, private outdoor patio and a heated garage parking space is available for an extra monthly fee of $200.00. Building is well constructed with concrete and steel, has an elevator & common roof deck with grill. Sorry no undergrads. Don't miss this one! Welcome to an urban oasis steps away from the T, shops, local restaurants and the city. Set on a natural rock ledge surrounded by mature trees, a spacious courtyard, and beautiful landscaping. Modern amenities abound throughout the sun-drenched space and blend wonderfully with period details and original features. A cozy fireplace, an inviting porch off the front bedroom, and basement storage are just a few great features! Rent includes heat and hot water. Parking including. This one is not to be missed! 24 Hour Showing Notice. Modern 3-Bedroom located off of Brighton Ave featuring an updated EIK with stainless steel appliances, large bedrooms with hardwood flooring throughout. Private rear deck, Coin-op laundry in basement. Includes 1 FREE off-Street parking space - additional available for rent. Heat and Hot Water Included**! Listed by Jaimi Meuse of Cambridge Realty Group, Inc.